As ever goals win games … or not. Portlaoise had two more shots than Kilmacud and also took shots that were expected, all other things being equal, to return a scoreline ~3pts more than Kilmacud. But Kilmacud ended up with 18 scores off a 64% Conversion Rate whilst Portlaoise returned 11 scores off a 37% Conversion Rate. This was an incredibly open game with 12 goal attempts returning 4 – 04 and a phenomenal 40 shots in the first half. I think I called it “brilliantly bonkers” on twitter. I mentioned the frantic pace at the start of Gaoth Dobhair v Crossmaglen as being unprecedented but we may need to review what the baseline for these upper echelon club games are. This game was every bit as frenetic; the first ten minutes produced 17 possessions with fifteen shots of which five were attempts at goal. The most striking aspect of Kilmacud’s shooting was how close in to goal it was. 28 shots in the game with only maybe one coming from outside the optimal shooting zone … and that was from Paul Mannion who, given his form, is allowed shoot from anywhere! 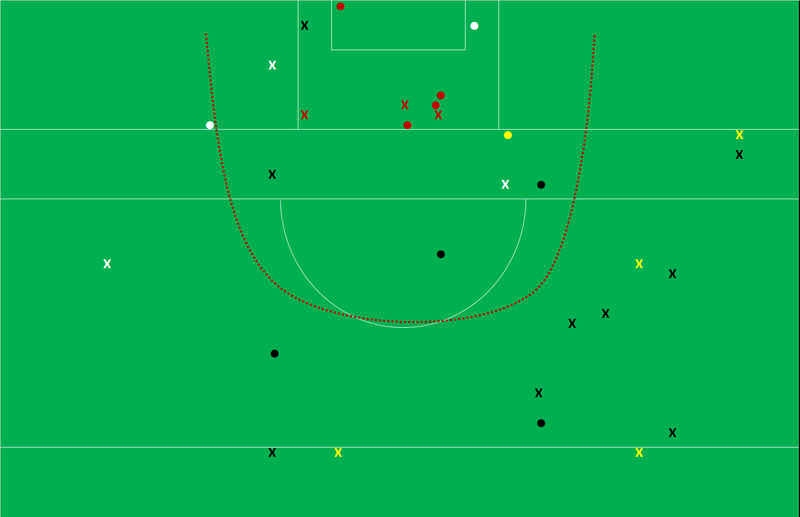 They were 58% (0 – 11 from 19; Expt pts of +1.72) on point attempts from play which is very good. The Conversion Rate was undoubtedly aided by their shot selection however the positive Expt Pts shows that they were still more accurate than the norm. At a macro level it looks like they are a very accurate team. We have the usual caveat of small sample size but this is the second recent game we have following the county final against St. Judes (didn’t do a write up but did cover the game) and they were 61% (0 – 11 from 18; Expt Pts of +2.71) on point attempts in that game. Kilmacud had five shots at goal returning 1 – 03 which is about average. In the aforementioned game against St. Jude’s they also had five goal attempts returning 2 – 00. There was nothing especially noteworthy about their free taking (0 – 03 from 4; Expt Pts of –0.65 as the one that Mannion missed was quite easy from the top of the D). Maybe Kilmacud might have a quibble at the dearth of frees as they’ve only had the five shots across the two games (four here and one against St. Jude’s) but Portlaoise and Jude’s combined for eight so there wouldn’t appear to be anything in that. A quick note on Cunningham who was excellent as the link man. He had six primary assists in all; five for point attempts and one for a saved Mullin goal attempt. remarkable considering the penalty save. I have penalties being converted ~80% of the time which means that a miss/save takes -2.35 off a team’s Expt Pts. 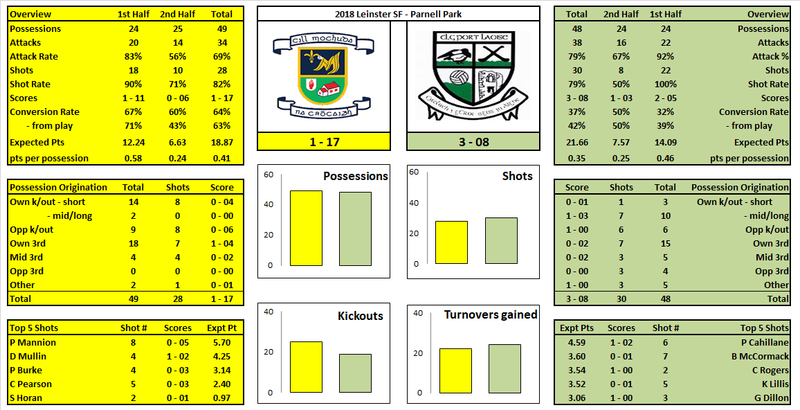 Overall Portlaoise recorded an Expt Pts of -4.66 so if their goal attempts came out more or less even then everything else must have fallen apart. They had five point attempts from deadballs returning just 0 – 01 (Expt Pts of -2.36). Whilst two of these were 45s you would expect, in the normal course of things, Brody to have slotted one of them. Cahillane’s sole score was on the 13m line from in front of goal It was effectively a gimme (they are converted in excess of 99% of the time) so whilst one of his misses was from quite a tight angle he basically doesn’t get any benefit from the score to balance this out. Then there was the point attempts. Portlaoise had 18 point attempts from play scoring just 0 – 06 (33%; Expt Pts of -2.83). Lillis and McCormack were the main culprits combining for 0 – 01 from 10. But more than individuals it was Portlaoise’s almost shoot on sight policy that hurt them. 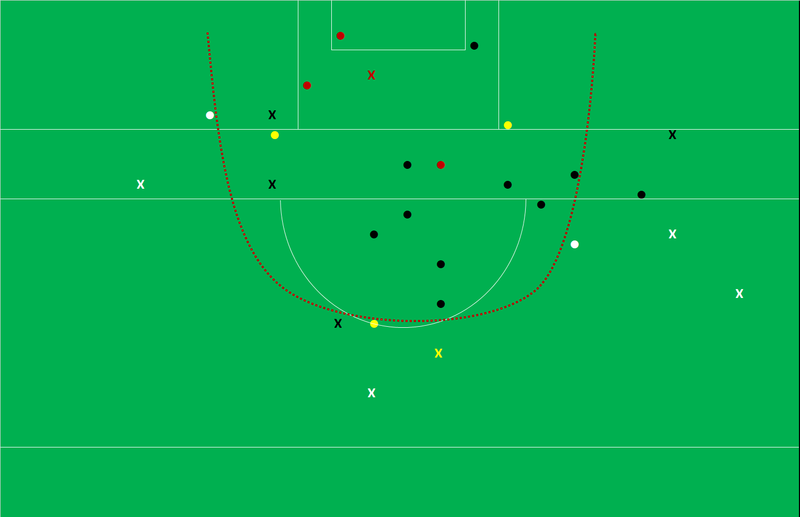 Below is a comparison of the two teams’ point attempts with Kilmacud in white and Portlaoise in black. Very crudely Kilmacud followed the Dublin template with 73% (16 of 22) of their kickouts going short. They weren’t overly efficient on these however letting Portlaoise get their hands on two, scoring a goal off one and only scoring 0 – 04 from the 14 they did win. Portlaoise were the inverse with 86% (19 of 22) of their kickouts crossing the 45. That made 25 kickouts in total crossing the 45 with Portlaoise coming out on top 14 – 11. Their poor conversion rates were evident again her however as they scored 1 – 02 from the eight shots off these kickouts whilst Kilmacud scored 0 – 06 off the 8 shots they manufactured.